Some customers in the Bristol area prefer to deliver their PCs to the BCS offices, we tend to visit businesses and other clients to collect their hardware and return once repaired. Some customers further afield prefer to courier their hardware directly to us and we courier it back. A key aspect of repairing PCs is to make sure that the data is backed up. So when we visit to fix your computer, or if you put you computer into our workshop for repair, the first thing we will do is backup your data. The repair will take less time if you can bring/handover any recovery DVDs for you computer. Software and licences can also speed up the repair, saving you time and money. We specialise in operating in and around the Bristol area. BCS can go further afield, please contact us directly if you require an estimate or more information. We will be adding various case studies to the right hand column, as examples of the kind of computer repairs we can do. 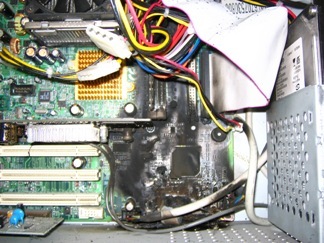 The PC displayed above did not take too long to diagnose. The unit had actaully caught fire! In this situation we were lucky to be able to remove the hard drive and recover all the data. The customer purchased a new PC from BCS, and we made sure that all their email, favourites and data files were pre installed. The PC was collected from their home and new unit delivered back same day.